West Haven, CT. -- In what was clearly the Bear’s toughest opponent to date, Brown came back from a low scoring first half with 24 second half points to defeat Yale 32-12. After a bit of rain during the week, the Yale field was a little soft but dry enough that neither team could hold the condition of the pitch as a factor in the result. In front of a Yale Parents’ Weekend crowd, the boys in blue came out hard on defense, with numerous take-aways, aggressive tackles and commitment. Add a 10 minute yellow card to Brown’s Jon Kim, and Brown spent much of the first half defending deep in its end and short one player. Yale’s defense held Brown to only 8 first half points but Brown was equally stingy, conceding but one first half unconverted try. 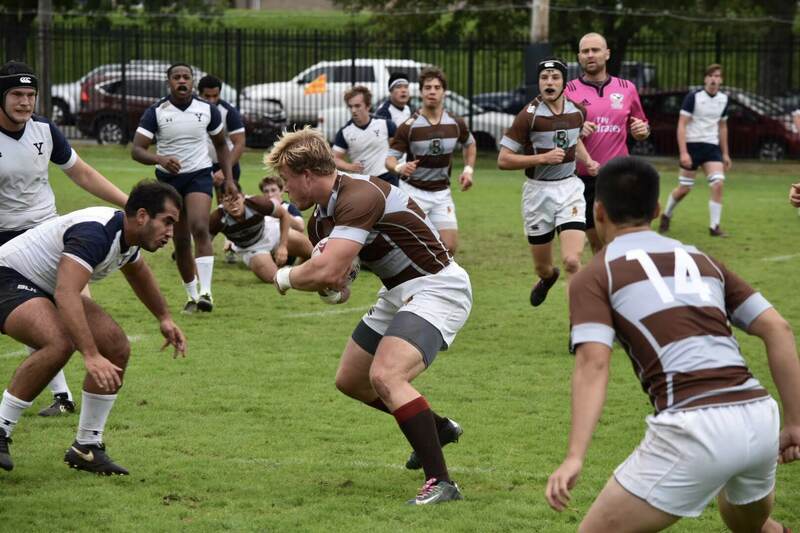 In spite of Brown being unable to get into any rhythm on offense, the Bears defended its line, repeatedly turning Yale away with impact tackles, counter rucks and turnovers. Brown scored but twice, on a penalty kick by Alex Ogilvy and a try as the first half ended by captain Jae Kim. Thirteen minutes into the second half flanker Constantin Gardey took the ball twenty meters up the middle, clearing the way for wing Christos Economos to make a 30 meter weaving run under the posts. With Alex Ogilvy’s conversion, Brown now held a 15-5 lead. Ten minutes later Brown was camped on the Yale goal line. Prop Jordan Anderson made a dash for the line but was tackled into touch. Brown re-secured possession of the ball and Anderson made the same run for the corner, this time scoring his first Brown try to up the Brown lead 20-5. At the ensuing kick off Anderson was removed from the match for 10 minutes due to a yellow card, With a man advantage, Yale moved the length of the field, not only scoring a try in the corner but kicking a very difficult conversion, reducing Brown’s lead 20-12. A converted try would bring the Yale team within a point of Brown. With only 9 minutes on the clock, the match was still in doubt, when Economos passed to wing Hudson Lee who out paced two Yale defenders and then lept over a third to score and provide the Bears with a 13 point cushion. A final score was initiated from a Brown scrum as number 10, Sean Lumkong,executed a long pass over several Yale defenders to center RJ. Oris for a twenty meter score, converted by Ogilvy.